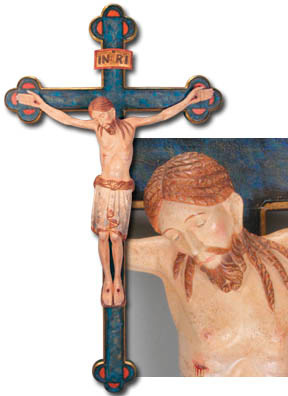 This unique crucifix is carved in linden wood and features a Romanesque corpus on a Baroque cross. Shown in an antique finish with gold leaf detailing. Other finishes are available, please call for pricing. Meyer•Vogelpohl offers a Gift Registry. If you are being ordained or celebrating an ordination anniversary, please contact us for information on this complimentary service.